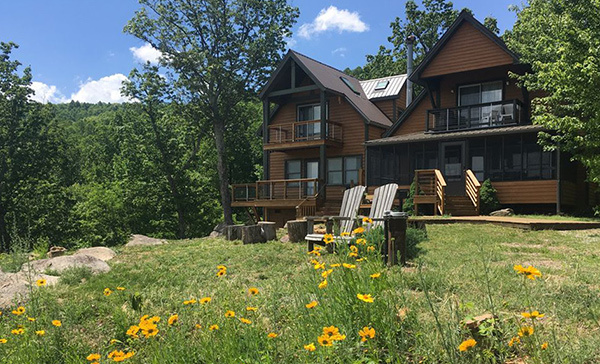 Perched on a scenic knoll overlooking incredible mountain vistas, the ‘Mountain Laurel Chalet’ is completely secluded on 26+ acres, yet is close to all the Blue Ridge Mountains have to offer – golfing, hiking, skiing, the Blue Ridge Parkway and the Appalachian Trail. Located just beyond the Wintergreen Ski Resort, the cabin is accessed by a private wooded half mile drive. This beautiful three bedroom, two bath chalet has spectacular views from every window in the cabin, plus the screened in porch, an expansive deck and fire-pit.